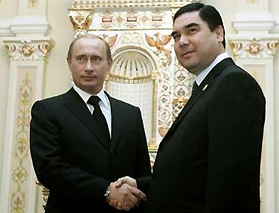 Гундогар :: Is Turkmenistan Being Pulled Into Russia's Orbit? In 2007, with world gas prices on the rise, Russia had promised to pay «European prices» to Kazakhstan, Uzbekistan, and Turkmenistan for their gas. The Kremlin didn't seem to believe Turkmen authorities' tales of tranquility along the Afghan frontier, which Russian officials with increasing frequency referred to as the «CIS border» with Afghanistan. On June 9, 2016, Russian Defense Minister Sergei Shoigu made an unannounced visit to Turkmenistan. Turkmen media was general in its reporting of Shoigu's visit, but Russian media was more to the point: Shoigu was in Ashgabat to «offer» Russia's help in strengthening Turkmenistan's military capabilities, including weapons sales and training. On November 22, the acting general secretary of the CSTO, Valery Semerikov, said in a statement posted on the CSTO website that there was a «real danger» from IS groups forming in Afghanistan along the borders with Tajikistan and Turkmenistan. «We expect concrete information about this soon,» Lavrov said on December 7, adding a mention of Boris Shikhmuradov, Turkmenistan's former foreign minister who was imprisoned after being found guilty of planning the alleged 2002 assassination attempt. International rights groups have been calling on Turkmenistan for years to release information about Shikhmuradov and show him publicly to prove he is still alive. Lavrov's mention of Shikhmuradov therefore raised a sensitive issue for Turkmen authorities. But then, Turkmen authorities and President Berdymukhammedov probably wish many things were different about the reality they now face. Turkmenistan has few if any real friends, an abundance of problems, and has left itself open to the intervention of a big power. Ashgabat might not be able to say «no» to Russia at this point.